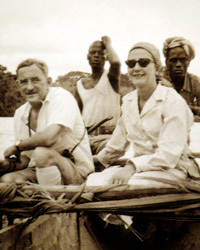 Geoffrey Kent and his parents, Valerie and Colonel John Kent, founded Abercrombie & Kent in 1962. The company's beginnings were modest; Geoffrey Kent remembers their first safaris were conducted with little more than "a Bedford truck and my mother's sterling silver ice bucket." In 1967, Geoffrey Kent (by now Managing Director, following his parents' retirement) decided to expand A&K's signature style of travel. In 1969, he began opening additional companies in Africa; in 1971, he met Jorie Ford Butler of Oak Brook, Illinois. She became a partner in the business and together they expanded A&K into a worldwide group of companies, with offices in London, Downers Grove, Illinois and Melbourne, Australia. Today, A&K runs 52 full-time offices worldwide, staffed by more than 2,500 people; it also operates its own safari camps and lodges throughout Africa and cruise ships on the Nile, Yangzi and Ayeyarwady Rivers, and maintains a fleet of customised safari vehicles. Its reputation allows A&K travellers private, sometimes exclusive access to museums, archaeological sites and cultural attractions around the world. The company's more recent innovations include Extreme Adventures that bring travellers face to face with nature at its most uncompromising, journeys by Private Jet and Connections - group journeys that offer a chance to discover the world in the company of unmatched local experts, at unbeatable value. A&K's staff continue to seek pioneering new ways of exploring the globe - and among it is Geoffrey Kent, who still travels the world interviewing guides, scouting locations and ensuring that the standards he and his parents established more than 50 years ago remain in place on each and every A&K journey. Geoffrey Kent was born while his parents were on safari and grew up on the family farm in Kenya. At 16, he became the first individual to motorbike between Kenya and Cape Town. Since founding Abercrombie & Kent with his parents, Geoffrey's focus has been to enable travellers to discover the world in a uniquely stylish manner. Geoffrey has served as President of The Prince of Wales Foundation in the U.S. and chairman of the World Travel & Tourism Council, and in April 2012 was named to the British Travel and Hospitality Industry Hall of Fame for his outstanding contributions to the luxury travel industry. Jorie Butler Kent is a businesswoman, conservationist and professional photographer. She is the daughter of Paul and Marjorie Stresenreuter Butler, who founded Oak Brook, Illinois. She and Geoffrey Kent are co-owners of the Abercrombie & Kent Group of Companies. Today, Jorie leads A&K's conservation efforts as president of Abercrombie & Kent Philanthropy (AKP). Between her travels, Jorie has found time to be involved in numerous organisations, including the World Travel and Tourism Ecological Research Centre, The Royal Geographical Society in London and The Explorer's Club in New York.